If you want to drink real Guinness visit Ireland, if you want to snowboard go to Alaska, and if you want to surf come to Puerto Escondido. There is truth in the hype, the waves here are some of the best in the world. The surf here will rock you to your core, if you're ready. There are three prime surf-spots within a short distance from the town-center; Carrizalillo, La Punta and Zicatela. Carrizalillo is where a lot of young locals learn to surf. It is a small horseshoe bay with an easy-going left wave (a wave which breaks to your left when surfing toward the shore), and a more difficult right wave which is generally considered for locals only. La Punta is a magnificent long left that breaks over a lot of rocks and can sometimes provide the Holy Grail of surfing, barrels! A barrel is a tube of water which the surfer rides through. Only a small amount of waves break with the correct shape and size to form a barrel big enough for a surfer to get through. 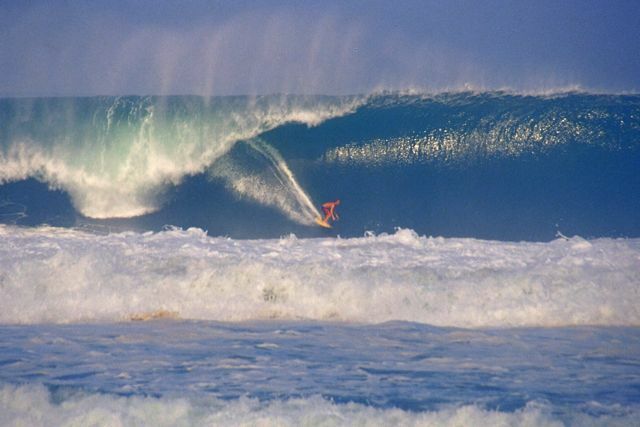 For a lot of experienced surfers one of the principle aims of surfing is to get barrelled. The rocks at La Punta have scratched and sliced a lot of skin over the years, and have broken bones. Yet on a small day La Punta is also a good place to learn how to surf and is very popular with the local surf-instructors, who can help even the most cautious and scared beginner catch their first wave within a couple of hours. They literally push the beginner onto a wave. Few sensations in one's lifetime can compare to the utter bliss that comes with catching your first wave! Then there is Zicatela. No words can describe its waves on a sizable day. It must be seen to begin to understand the sheer beauty and force of this phenomenon. If you have enough experience and courage you should paddle out to discover what all the fuss is about. The wave is pure power. It will make or break you. Take a bad wipeout at Zicatela and you might not return for more. A bad wipeout is an unsuccessful attempt to catch a wave - being thrown into churning water with a lot of force, usually losing all the air from your lungs and then being held underneath the water for what can seem like ages, while your lungs burn due to a lack of oxygen and your mind imagines death by drowning. Make a good wave at Zicatela and you are the master of the universe. 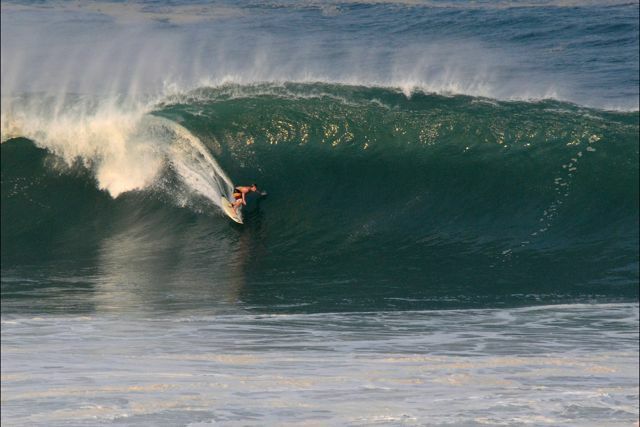 Zicatela is renowned for barrels, lefts and rights. On a good day there is no time for maneuvers – rapid twists and turns on the face and the lip (crest) of the wave. It's simply a critical and fast drop into the wave, entry into the barrel and every effort possible to make it out to the other side. To be properly barrelled you've got to make it through the tube and back out to daylight. Watch a surfer's reaction after coming out of a good barrel at Zicatela and you will see the essence of human ecstasy. But on a big day Zicatela is a merciless beast that chews good surfers up for breakfast and spits them out in a tangled mess. Is there any other wave on Earth that breaks as many surfboards? Some of the big-wave riders that come here from around the world have claimed that when Zicatela is big it's one of the toughest waves there is. Unlike other famous big waves like Waimea in Oahu, Hawaii, or Mavericks, just south of San Francisco, Zicatela doesn't have a channel of water that allows easy access to the take-off zone, where the waves are caught. Before you can find the right position to catch a big wave you have got to get through a series of breaking waves that could kill you in an instant. The shallow bottom seabed means that if a wave catches a surfer and throws him, or her, onto the seabed with all its force the surfer may be seriously injured or killed. Nature has no mercy. Fortunately, the majority of surfers who attempt to surf Zicatela on a big day are very experienced and know how to avoid accidents. But a lot of them describe paddling out at Zicatela as a brutal experience. On an above-average day at Zicatela there are many brutal experiences when people wipe out and then get caught in the impact zone. This refers to an area where sets, groups of waves, are breaking with all their force continuously. Caught in this position a surfer has to duck underneath a breaking wave, get tossed about like a rag-doll by churning sandy water while trying to avoid hitting the seabed, and then struggle to reach the surface for one gasp of air before being hit by the next wave, and then receiving the same treatment all over again. This can happen repeatedly ten or more times, but it’s usually less. Either way it feels like it will never end and it requires healthy lungs and stamina. So why do surfers do it? What drives a sane person to put their body and mind through such punishment? The reward! The joy, satisfaction and contentment that a surfer feels after a good session. Sure you've got to learn the hard way, you can't improve as a surfer unless you push your limits and experience some knocks, cuts, bruises and heavy wipeouts. But when you do improve and you slip away some sunny weekend with a couple of friends and find a quiet break with beautiful waves that you surf well, then life has found meaning, the mind knows peace and all is right in the world. Or if you walk to the shore ten minutes before first light, paddle out before everyone else, so you can surf for an hour before work, and do something on a wave you've never done before, a maneuver executed with such panache that you surprise yourself, then your day will be exceptional and your self-esteem will reach new highs. And if you rise to the challenge of a wave like Zicatela and overcome all its daunting rites of passage, and catch a lightning-fast and unforgettable barrel, then you have experienced one of the greatest forms of pure happiness, the feeling of the victorious warrior.